MainAll NewsForeign AffairsIs Bold Alligator Eyeing Tehran? Is Bold Alligator Eyeing Tehran? Diplomatic sources say Iran is accelerating uranium enrichment as the United States and eight other countries stage a major amphibious exercise against a fictional nation that looks suspiciously like Iran, Gulf News reported. Tehran's push to accelerate nuclear work at the Fordow underground facility near the central city of Qom underlines the failure of Western-led sanction to deter Iran from its push for nuclear weapons. In December 2011, the International Atomic Energy Agency reported Tehran had conducted - and continues to conduct - nuclear technology of a military nature. Last month, Iran confirmed it had begun refining uranium to a fissile concentration of 20 percent at Fordow, having moved its highest-grade enrichment deep inside a mountain fearing military strikes by Israel or the United States. The high fissile concentration being produced at Fordow far exceeds the more than 3.5 percent level usually required to power nuclear energy plants. Tehran says it will use 20 percent-enriched uranium to convert into fuel for a research reactor making for medical treatments, but Western officials say Iran does not have the technical capability to do so. In addition, they say, Fordow’s capacity is too small to produce the fuel needed for nuclear power plants, but ideal for yielding smaller amounts of high-enriched product typical of a nuclear weapons program. The move to accelerate enrichment at Fodrow comes just days after US President Barack Obama implemented a new round of sanctions targeting Iran's central banks and allowing Iranian assets in the US to be frozen. Nuclear bombs require uranium enriched to 90 percent, but reaching 20 percent purity simplifies the process and shortens the time needed for a nuclear weapons “break-out”. Western experts estimate Iran could assemble a nuclear weapon from six months to one year. 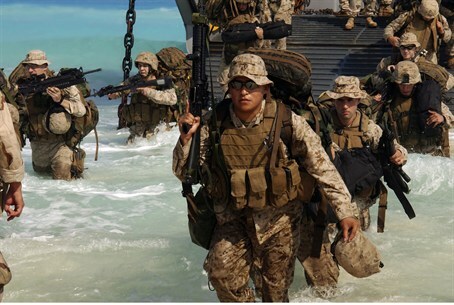 U.S. Marines have spent a decade out of their native element in the deserts of Iraq and mountains of Afghanistan, but with the Pentagon's restructuring and forward-focus on Asia, the Marines are returning to their roots. Bold Alligator began on Monday with its "D-Day" near Camp Lejune and is expected to last ten days. The exercise scenario takes place in a fictional region known as “Treasure Coast,” with a country called Garnet, a theocracy, invading its neighbor to the north, Amberland, which calls for international help to repel the attack. While commanders say the scenario is not based on any particular country, observers note it includes the threat of mines, anti-ship missiles and small boats in coastal waters. Military analysts say such a scenario and foe bears a striking resemblance to Iran and its naval forces, as well as its likely strategy should Tehran move to close the strategically vital Strait of Hormuz. When asked by reporters last week, Harvey acknowledged that the exercise scenario was “certainly informed by recent history” and that it was “applicable” to the Strait of Hormuz, as well as other areas. Analysts believe the drill is intended to reinforce President Barack Obama's assertion that "all options," including a military strike, "remain on the table," vis-a-vis Iran's nuclear program. Airstrikes targeting Iran's enrichment facilities, they say, could be accompanied by a short-term ground operation aimed at securing the Iran's coastal Bushehr nuclear plant and naval bases. An attempt by Iran to close the Strait of Hormuz is widely believed to be one possible trigger for a US strike on Iran's nuclear facilities.